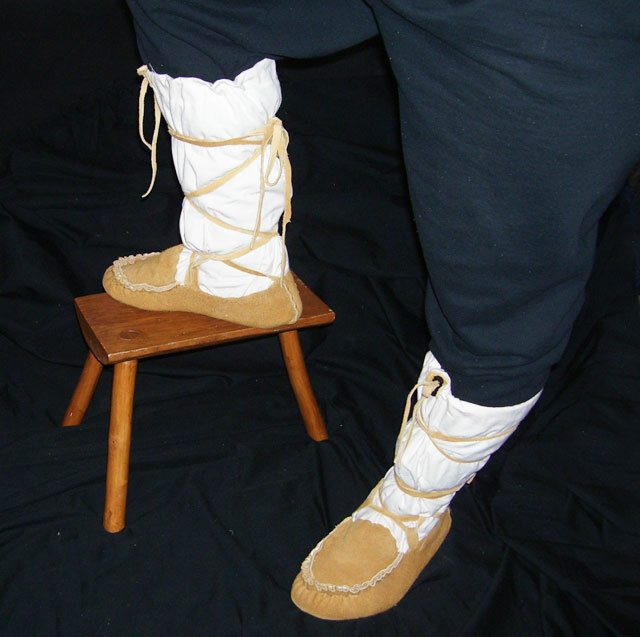 Mukluks or Kamik are a soft boot traditionally made of reindeer skin or sealskin and were originally worn by Arctic aboriginal people, including the Inuit and Yupik. The style here will be of tanned moose, elk, or buffalo hide suede or flesh-side out with a canvas legging. Since I live in the Northern Midwest I thought it prudent to do research in order to try and replicate what indigenous people in my region and farther North wear to keep warm. So I took a class on how to make a pair of this winter-time footwear. The instructor of the class, Ms. Jo Wood, was very knowledgeable on both how to teach us how to make our own pair (everyone in the class completed their own pair from scratch...even a few who had never sewn before), she is also a master bead-work artist. Be sure to check out her web site cited below, and acknowledgment on the pattern and construction of this design goes to her. The style here will be of tanned moose, elk, or buffalo hide suede or flesh-side out with a canvas legging. This pattern does not represent any traditional pattern or stitching methods of any indigenous peoples, or ethnic group. Mukluks or Kamik are a soft boot traditionally made of reindeer skin or sealskin and were originally worn by Arctic aboriginal people, including the Inuit and Yupik. The word "mukluk" is of Yupik origin, from maklak, the bearded seal, while "kamik" is an Inuit word. Inuipiaq language the "u" makes an "oo" sound, and so the spelling "maklak" is used with the same pronunciation. Mukluks are very practical in dry cold snowy environment because they allow the foot to breath, unlike many contemporary boots that hold perspiration of the foot in and conducts cold to the feet through rubber soles or synthetic materials. The moisture from sweaty feet can cause frostbite. The downside is that they allow the foot to get wet in melting and slushy snow...so be warned. This tutorial will show you how to make a pair of mukluks from a cast and pattern made from your foot. I have tried to make this tutorial as clear as possible. A good working knowledge on how to sew by hand and/or the use of a sewing machine is necessary. Also it is a good idea, before cutting into your hard earned or bought leather to make a mock-pair out of a pillow case or old sheet to be sure you understand the procedure and your pattern fits. Also, as I mentioned above traditionally mukluks were made of reindeer and/or bearded seal skin, elk, moose, or buffalo. Whitetail buckskin can be used, but you may need to double or triple the leather to replicate the thickness of hide of the other larger animals. Lastly, a good thing to do before you try to construct anything from a tutorial is to read through it thoroughly, and be sure you understand what the procedure is first. Good luck!